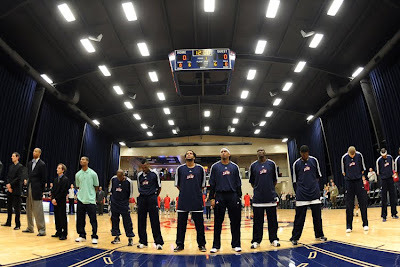 The Empty Stadium: The Bakersfield Jam: Empty and elitist? 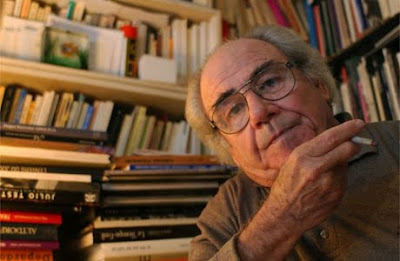 The original idea for the name of this blog begins with the French philosopher and sociologist, Jean Baudrillard. Besides his many seminal works regarding postmodernity and/or post-structuralism, Baudrillard spent a bit of time theorizing sports, stadiums, and TV. The man had many leather-bound books, not pictured. In particular, he noted the powerful effect of removing fans from a stadium and broadcasting the event through TV, a process that displaces the real game for a media representation (he was taking stock of a 1987 European Cup soccer match played in an empty stadium in Madrid between Real Madrid and Napoli). For Baudrillard, then, the real game - if it's not being played in front of anyone - doesn't even have to take place as long as it is broadcasted: "No one will have directly experience the actual course of such happenings, but everyone will have received an image of them." It is ideas like this that continue to fuel my attention to stadiums and sports around the world. 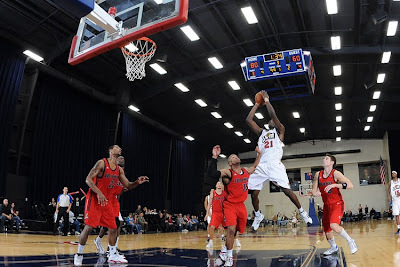 With that said, I'd like to point to an interesting experiment by the NBDL's Bakersfield (CA) Jam. Granted, the situation is not exactly the same as what Baudrillard references above - but it is interesting. 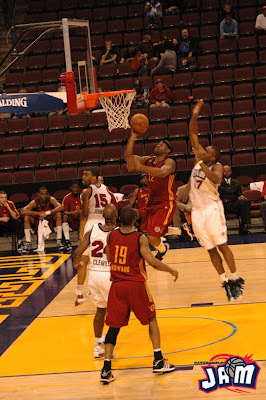 After just three seasons in existence as an NBDL franchise, the Jam decided to cease operations after their playoff exit following the 2008-2009 season. According to owner Stan Ellis, even with the franchise posting its first winning season, the team could no longer afford to continue because attendance figures were abysmally low. including the Bakersfield Fundamental Bounce Pass. While the goal was to draw about 3,500 fans per game, the Jam regularly mustered less than half of that figure and averaged just about 2,000 fans per game for the season. Contrast these figures with the 7,000 per game average for the Bakersfield Condors - the minor league hockey affiliate for the Anaheim Ducks - and you can imagine that a Jam game would have seemed pretty empty inside the 10,000 seat Rabobank Arena. the Rabobank Arena. Or this layup. Then, just a couple months later - in June - Ellis announced the team would not go under and "armed with a new business model" would play in the 2009-2010 season. What this new business model would entail, Jam fans would later find out, would be staging games in the recently-constructed Jam practice facility - known as the Jam Events Center. Essentially, the Center is every bit a practice gym with a few small seating areas surrounding the court and a couple of skyboxes in place above the court at either end. White linens courtside? You got it. The court is part of a larger convention hall that comprises the Jam Events Center. According to a report from the D-League Digest, this setup allows for just over 400 tickets to be sold for each of the Jam's 21 home games. Those season ticket packages - which include parking, catered dinner, open bar, and access to a cigar room - range from $3,000-$4,000 per seat. 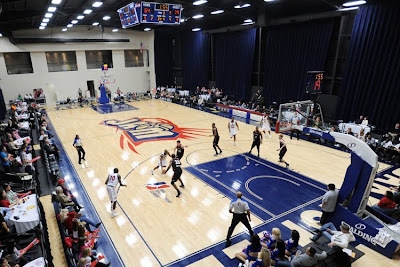 The skyboxes located at the Jam Events Center, while pushing capacity to 550 fans, are for sale at $40,000 a year. Because of these ticketing arrangements, there are no upfront ticket sales for any Jam games at the JEC this season (the team will play one game in March at the Rabobank Arena). Ellis, responding to criticism last summer, said he realized "the flak I'll take for making this elitist. I don't want to do that. That's not the goal...We do want to serve the public to some extent. The first objective, it's sad to say, but we've got to make profit." The team has struggled this season, with a home record of 4-9 (8-23 overall). Perhaps if someone courtside would pass them some brie. Sounds bizarre, but apparently this new business model seems to be working for Ellis - in part, because the Jam have catered mostly to area businesses, encouraging a networking-like atmosphere before, after, and during the game. More importantly, other NBDL franchises are now monitoring the situation to see if this kind of business model is viable for the long term. The minor league sports system has seen its share of peculiar ideas. This example reinforces the business element that is inherently connected to professional sports today. In Bakersfield, CA, if you're willing to accept that and can afford it, you can eat and drink all you want while NBA-castaways toil within smelling-distance. And while it's not exactly Baudrillard's empty stadium (the Jam don't have a TV broadcasting contract), it is another interesting case of sport and commercialization in our society.